Campaign for the American Reader: "Why aren't you doing anything?" I asked Deborah Klosky if she had any ideas for fiction that illuminates what's at stake in the debate over habeas corpus. The first is The Handmaid's Tale, by Margaret Atwood. It's set in a totalitarian theocracy, so that of course pretty much does it for any individual rights. The main character is one of the women who have essentially been sentenced to arrest and servitude for the crime of having shown they can bear children. The other is The Fixer, by Bernard Malamud. Malamud wrote about a Jew who is imprisoned and awaits trial on a false ritual murder charge brought by officials of Tsarist Russia. It's somewhat based on an early twentieth-century case (where the accused was finally found innocent), and the book shows an individual trapped in an unjust system. There is a good summary/review of The Fixer here. Malamud's New York Times obituary--he died in 1986--noted: "The Fixer (1966) was inspired by the ordeal of Mendel Beiliss, a Jew tried and acquitted of ritual murder in Kiev in czarist Russia of 1913." When I finished reading this novel, I felt castigated and inspired. Grumbling about the state of the world suddenly wasn't enough. And excusing myself from political activity felt wrong. In light of this book, my inaction felt immoral. While The Fixer isn't a book about morality, it is a moral book. That is, rather than offering a flimsy directive, it presents the reader with a forceful question: Why aren't you doing anything. 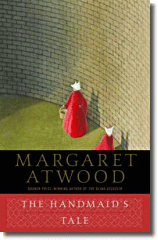 While I hope that Margaret Atwood's story is not prophetic, she has told the story of one reader who insisted she lived through such an experience: "One man was absolutely convinced that The Handmaid's Tale was autobiographical. I said, 'But it's about the future.' He said, 'You could not have written about this unless something like it had happened to you'." Deborah Klosky has worked as a journalist and writer for 15 years, while living in the U.S. and Europe. You can learn more about her at her brief biography posted at Spot-on.com, and click here to read some of Deborah's recent columns. Thanks to Deborah for her reading suggestions. Click here for the growing list of titles in this series.